Barry Richmond was the founder of isee systems and pioneer in the field of systems thinking. When his life was cut short by a sudden fatal heart attack, Barry was in the prime of his career and the systems thinking community experienced a collective sense of loss and grief. Barry was fully engaged in bringing systems thinking to everyone. He saw how this powerful way of thinking could help people to better understand society’s most pressing issues and make the world a better place. Barry saw K-12 education as one of the keys to creating a better world. He spoke often about educating young people to become ”systems citizens” and preparing students for the complex problems they would have to face. Much of his time was devoted to training teachers to incorporate systems thinking into curricula and pedagogy. A couple of years ago, Barry’s daughter, Joy Richmond, began spearheading an effort to create a book in honor of her father. Joy invited a group of us together to talk about some ideas for the book and come up with a plan to make it happen. The first idea we discussed was writing the book that Barry himself had intended to write. Barry left plenty of notes and even had a working title for a book about systems thinking called Traces. We all agreed that it would be much too daunting to try to write a book for Barry, so we decided to have a book written in tribute to Barry by friends and colleagues who share his passion for systems thinking. Steve Peterson, Corey Peck and Khalid Saeed were all part of that original discussion and eager to contribute by writing a chapter. Each had a story to tell about using Systems Thinking in their work and why it is so important in an increasingly interdependent world. What better way to honor Barry than writing a book that helped get the word out about systems thinking! Lees Stuntz, Executive Director of the Creative Learning Exchange, was also in on the discussion and excited about asking educators influenced by Barry to contribute their stories. Before we invited other authors however, we wanted to provide some guidelines that would tie the book together and give it a more meaningful context. I think it was Steve who came up with the idea to use the critical thinking skills first outlined in an article Barry wrote for the System Dynamics Review titled “Systems Thinking: Critical Thinking Skills for the 1990s and Beyond”. We agreed the systems thinking skills would provide a good foundation for the book and each author could then choose a few of the thinking skills to emphasize when telling their story. 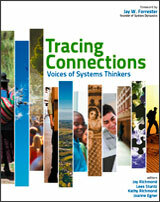 Countless hours of writing, editing, and designing later, Tracing Connections: Voices of Systems Thinkers was born. Published in partnership with the Creative Learning Exchange, proceeds from the book will fund scholarships that offer learning opportunities for educators to use systems thinking and system dynamics in K-12 education. The response so far has been excellent and we are pleased to be funding scholarships to help educators attend the ST/DM Conference later this month. What is especially nice about the book, is that you don’t need to read each chapter in sequence. Since the authors’ experiences range from education and research to business and public policy, there’s sure to be a chapter for everyone. Click on the link below to view the chapter by Frank Draper titled “Teaching by Wondering Around: Learning About the World Naturally”. Frank tells a wonderful story about how Systems Thinking has transformed the way he teaches science to high school students. After reading it, you’re going to wish you could enroll in one of Frank’s field science classes at Catalina Foothills school district in Tuscon, Arizona.